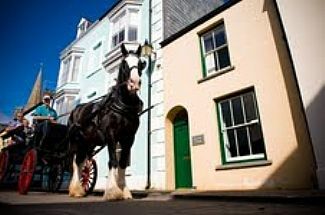 One of the best locations in Tenby, perfectly placed for a holiday within the Medieval Town Walls 50m from the cliff top gardens of The Paragon and beach below. A quiet yet very central sunny street. Easy to get everywhere, enjoy the beaches, cafes, shops, restaurants, pubs, harbour all on foot. Skrinkle Cottage is a gorgeous Georgian style terraced property built around 200 years ago and has been fully renovated for light modern living in this characterful cottage. Free wifi, fast broadband speed, flat screen TV with Freeview channels and super-efficient central heating. A brilliant feature of an 'out room', a beautiful sunny walled extension of living space straight out of the kitchen from glazed French doors. Charcoal BBQ and outdoor wooden table & chairs. We love living in Pembrokeshire, the coastline, beaches and food culture are fabulous along with the ancient castles and rugged landscape to the north and the gentle rolling green fields in the south. Its the perfect place to bring up our boys. Our farm is surrounded by fields and woodland on which we keep Welsh Black Cattle and horses, chickens dogs other animals. It's just near a castle, pub, tidal estuary and only 5 miles from Tenby. Over the years we have lovingly renovated and built cottages, barn conversions and recently a Shepherd's Hut a few of which are still available for visitors to stay in. Bathroom with bath / shower over, wc and sink. Situated on first floor between main double and twin rooms. Just a few steps from Tenby's award winning golden sandy beaches. Walk to many beautiful Tenby and Pembrokeshire beaches. Boat trips across to Caldey Island, watersports, sailing, sea fishing, open water swimming clubs. Tenby is probably the most iconic seaside town in Wales. C13th walls, colourful Regency houses, beautiful harbour, award winning golden sandy beaches, shops, town market, pubs, cafes & restaurants. Super efficient combi-boiler, mains gas powered radiators. Also a cast iron stove in living area. Bath and hand towel per person plus bath mat and hand towel by bathroom sink. Clean tea towels and oven gloves too. Fast broadband from BT Hub provides wireless internet throughout the cottage. Living room area has both a 2 and 3 seater sofa, a cushioned wall seat & squashy cushions (storage under has vacuum cleaner, games), large flat screen TV, coffee table, wooden floor & rug. Books & games. Free wifi. Fully fitted kitchen, electric cooker, 5 ring gas hob, fridge and small freezer, microwave, toaster, kettle. Big wooden table and chairs. Crockery, cutlery, cafatiere, glasses and cookware for up to 6 people. Sheltered sunny, walled garden area out of big French doors from kitchen. Wooden decking. Outdoor dining table and chairs. Charcoal BBQ. Less than a mile to Tenby Golf club, situated behind the South Beach, Tenby. A wonderful links course with sea views. Trefloyne, Penally, 2 miles from Tenby town centre. Beautifully kept, lovely club house - great place to eat. Heatherton short, par 3 course...bring the family to try all of the other activities. Notes on accommodation: Sorry no smoking. Dogs are allowed but please discuss with owner. We have make a small charge of £30 for dogs to cover extra cleaning costs and have a few house rules: dogs have to stay downstairs at all times (there is a stair gate) off furniture and please bring their own beds / cages to make them feel at home. Also throws for the sofas, this helps stop hairs, sand etc as they brush past. Thank you. Mains gas central heating with controllable radiators in every room and a cast iron fire powered by gas. Travel cot and high chair stored in cottage. Outside: Beyond the kitchen is an 'outside room' A high original stone walled yard area with decked floor, patio table/chairs, barbecue, drying line. Safe place for little ones to play. Beautifully sheltered sun trap. Just off the kitchen so an extra 'dining room'. The closest beach is less than a minute on foot, the other Tenby beaches and Caldey Island boat are a 5 minute walk. Utility Room: No washing machine, however there is a launderette in the adjacent street (about 1 minute walk away). Cleaning / Towels / Linen / Maid service: Weekly changeover & clean between 10am & 3pm, Friday (short break days vary). Beds are made up, bath, hand, tea towels, oven gloves (not beach towels) provided. Fresh flowers, tea, coffee, milk & welsh cakes to help you unwind on arrival. Other: Free WIFI in the cottage. Would definitely stay again. Just perfect. Peter was a fantastic guest, so easy to communicate with and joy to have his very upbeat messages over Christmas. Would highly recommend him to stay again. We have had a lovely time at Skrinkle, it’s a cute beautiful cottage in such a lovely town with the beautiful Tenby beaches , restaurants, pubs and shops just a stone throw away. Hope to stay again soon. Thank you Sally for the lovely welcome. Skrinkle is a lovely quaint cottage, ideally situated. The dog friendly south beach is a couple of minutes walk away, our two Jack Russells loved their daily run on the beach, a minutes walk in the opposite direction and you are in the middle of the shops, bars and restaurants. We enjoyed fantastic weather for late September and will definitely try to stop here again next time we visit Tenby. Brilliant, thank you for taking the time to comment. Really glad that you enjoyed Skrinkle & Tenby, September is a lovely time to visit. Hope that you do make it back. Would thoroughly recommend a stay at Skrinkle Cottage. It's central location is perfect for nipping into town or popping down to the beach. We parked in the nearby Rectory Road car park - a five minute walk away - and bought a ticket for the week. Able to stop and unload fairly easily, but needed to get our head around the one-way system. As for the cottage, it's clean, quirky and functional. The beds are incredibly comfortable with good quality linen. Has the added bonus of being dog-friendly. Loved it. Thank you for your message Jan, hope to see you in Skrinkle Cottage again sometime. Wildlife spotting, fitness training, painting amazing views or historic architecture, walking coast path, sailing and all other water sports. Tenby is on rocky promontory surrounded on all 3 sides by golden sandy beaches. Skrinkle Cottage is just 50m away from the Paragon cliff top gardens overlooking the sea and Caldey island also the steps down to the Castle beach; perfect for pre-breakfast dips and sunbathing. Meander for less than two minutes on foot to the picturesque harbour, along interesting narrow streets past the shops, cafés, restaurants, art galleries and pubs. Take a trip to Caldey Island. Try a bit of sea kayaking. Tenby is around 1 hour 45 minutes from the Severn Bridge via the M4. Tenby railway station is serviced from Carmarthen & Swansea main lines. 8 miles west - Pembroke Dock directly links to the Irish ferry (44 miles across to Ireland, day trips are possible). Easy to pick up and drop off directly outside the cottage. Rectory car park £20/wk 2 mins flat walk away, other car parks near. The local buses link to Pembrokeshire Coastal buses, specifically the Coastal Cruiser. Oakwood, Heatherton, Manor House Wildlife Park, Tenby Leisure Centre, Dinosaur Park, Ritec Valley Buggies etc. etc. all within a 10 mile radius. Shopping for food can be pleasurable, try Four Seasons for fresh fruit and veg, Simply Seafood on the harbour for the daily catch or jump on a mackerel fishing trip. There are so many places to eat and drink - we love pizzas from Top Joes, coffee in Cafe Vista, a full breakfast in Dennis' Café, cup of tea on the harbour; a special meal in The Plantagenet or The Blue Ball, a cosy winter warmer in The Quay Rooms near the Tudor Merchant's House. Enjoy the lively atmosphere in Tudor Sqaure...The Hope, Tenby House, The Buccaneer and The Lifeboat. Launderette in Lower Frog Street is directly parallel to Skrinkle Cottage. Supermarkets - Sainsburys (by the multi storey carpark) or Tescos Express in the middle of town. HSBC, Barclays, Natwest, Santander have branches in town with a number of cash machines. Art galleries. Lifeboat Station. Museum. Visitor attractions galore! - Heatherton, Manor House Wildlife Park, Oakwood, The Dinosaur Park, Ritec Valley Buggies and many more. Tenby leisure centre with indoor pools, finess classes, gym. Castle hopping from Manorbier, Carew, Pembroke etc etc! Surfing, coasteering, kayaking, Iron Man Training (not for the faint hearted!). Mill End Cottage, Middle Barn and Kiki's Cottage are a stone barn conversion into 3 properties in the middle of Lawrenny FOR SALE with FBM Estate Agent. Booking Notes: £200 deposit to be paid by cheque or bank transfer to secure a booking. The remaining balance 6 weeks before arrival. An email will acknowledge the deposit (or posted by request). A receipt for balance along with arrival details, directions, key etc will be posted. We do have a set changeover day but please get in touch if you have specific requirements and we will try our best to help. Dogs are welcome, for a small charge of £15 per stay. Please discuss with us first. Changeover Day: Friday weekly changeover. Weekend breaks often available in the off-peak weeks, ideally Friday to Monday of or Monday to Friday for a 20% discount. Sometimes this can be flexible so please ask and we will try to help. Notes on prices: Weekend breaks often available in the off-peak weeks, ideally Friday to Monday of or Monday to Friday for a 10% discount. Sometimes this can be flexible so please ask and we will try to help.